Buckeye Bullet Team Blog: Buckeye Bullet 2 On the Discovery Channel Tomorrow Night!!! Buckeye Bullet 2 On the Discovery Channel Tomorrow Night!!! 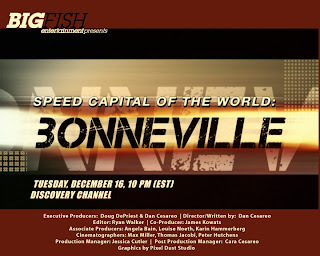 This summer the team worked with Big Fish Entertainment to produce a show for the Discovery Channel called "Speed Capital of the World: Bonneville." The show will premier on Discovery and Discovery HD on Tuesday night 12/16 @ 10pm following "Dirty Jobs". It will replay several times over the next few weeks at various times, check your local listings at: Discovery Channel Listings. The camera crew followed several major Bonneville teams at Speedweek 2008. The crew also visited CAR in the final days before heading out to the salt. It should be an entertaining show and provide some great exposure for the team. Thank you for your continued support and Happy Holidays from the BB2 Crew! Amazing job guys. Can not wait to see what this thing can do next year. Try not to waste to much 500 dollar tape next time! my fingers are crossed that all goes well for you guys... one buckeye to another!